Enjoy a $50 food and beverage credit, 2 handcrafted cocktails daily and waived cover charge at Backstage LIVE! Flexible travel dates? Take advantage of hot rates on select dates in 2019. Limited availability. Book Now! Book one of our suites and take advantage of a delicious charcuterie board, choice of wine and waived parking & resort fees. Rise, shine and toast the morning with a scrumptious breakfast for two! Plan ahead, confirm your room, and save big with our Advance Purchase Rate! Linger Longer and save up to 25% on stays from 3-5 nights. Show some love and discover a special incentive we have just for you! As you walk through the lush, manicured grounds of this intimate resort-style property, it is hard to believe you are just minutes away from the best sights in San Diego, California. 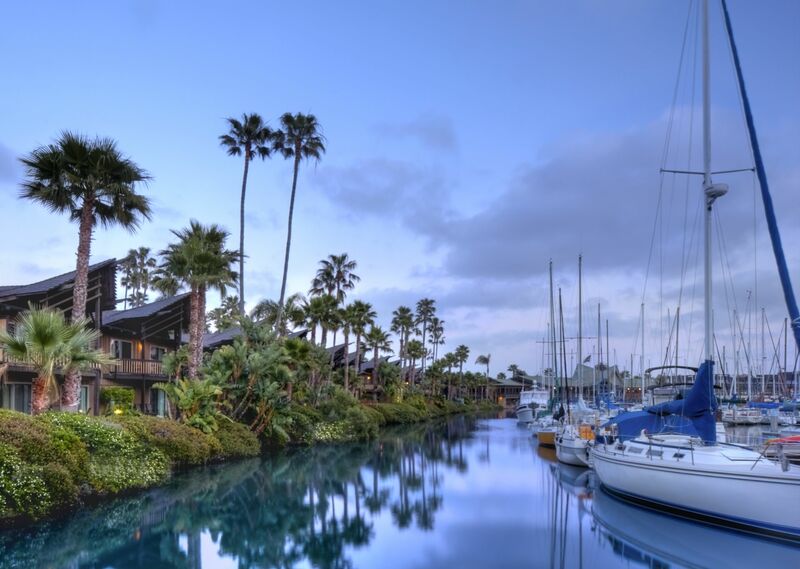 Situated on secluded Shelter Island, Humphreys Half Moon Inn is close to popular landmarks and attractions like sparkling beaches, the San Diego Zoo, SeaWorld, and the downtown Gaslamp Quarter. Our tropical San Diego hotel is a hidden oasis offering guests the perfect combination of comfort, convenience and hospitality in sunny Southern California. Whether you're visiting us for business or pleasure, you'll enjoy our waterfront location, resort-style activities, modern guest rooms and spacious suites, stellar dining, stylish event facilities, and excellent service. In the evenings, the sound of live music beckons. Sway with the palm trees to the rhythms of your favorite nationally renowned artist at our waterfront concert venue, or dance each night away in our live music lounge. Humphreys tropical vibe artfully blends the Aloha spirit with the music of a variety of styles. You will feel worlds away knowing you have discovered the best Shelter Island San Diego hotel--and kept secret. DJ Chuck aka "Big Country"
Discover a charming tropical retreat with inviting guest rooms and deluxe suites accented by a full menu of amenities and a glorious waterfront location. Humphreys Half Moon Inn invites you to relax, unwind and enjoy the comforts and conveniences of our boutique accommodations with contemporary décor, plush beds, 42 " LCD HD flat screen televisions, in-room massage services, and a host of other features all designed to ensure a comfortable stay in sunny San Diego. Charming Resort Accommodations by the Bay! Settle in for a comfortable stay in one of our luxurious hotel suites in San Diego. Perfect for vacationing families, groups or business travelers, our well-appointed suites offer all of the comforts of home plus resort style amenities and a waterfront location in the heart of scenic San Diego. Introducing Relax & Enjoy Rewards Club! Awarded "Best Brunch" in the San Diego Union Tribune's "Best of" Reader's Choice Poll for 2018! Awarded "Best Live Music Venue" in the SD Union Tribune's "Best of" Reader's Choice Poll for 2018! Enjoy the Festival, the Parade & More! Tee off with Dad this Father's Day. Celebrating Father’s Day in San Diego? Treat Mom to a fun-filled day in San Diego! If you are looking for a great place to stay at in San Diego, come to Humphreys Half Moon Inn. The rooms have a great view along with your own private patio. I felt like it was more like a condo. We had a full kitchen and living room. I did not want to leave! Very nice hotel and great location with a bay view. Very quiet and relaxing. Location is close to the city center by bus or taxi. Food is good, and staff is nice. I enjoyed my stay and i will come back for sure if i visit san diego again. The grounds, pool and gardens make you feel like you are in a Polynesian paradise; it is a truly unique property that will far exceed your expectations. The staff were incredibly friendly and the we ended up dining at the restaurant three times in our short stay because it was so good, great service, and very well priced. Whenever we are in San Diego we always stay at Humphreys, the grounds are beautiful and the view of the marina is wonderful. Its an easy 15 min drive from the airport and downtown San Diego. If you are down for Comic Con it has a shuttle to the Convention Center which is a blessing. The staff are very friendly, and this hotel has ample parking.I highly recommend Humphrey's Half Moon Inn for your next stay in San Diego. We'd recommend this hotel to all our friends & family!! What a nice stay at the Humphreys! This hotel really exceeded our expectations!! The staff at the reception was really nice and the room was clean and beautifully decorated! As we were so happy about choosing this hotel, we extended one night!